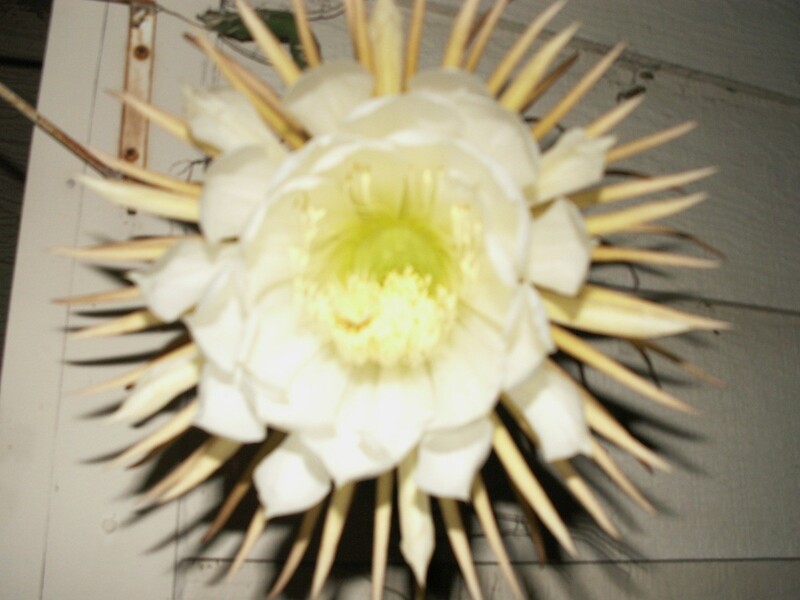 The beautiful, fragrant, white flowers of this cactus family member, only bloom at night. 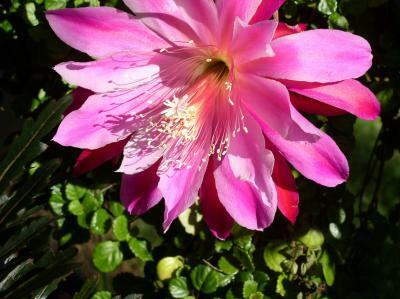 This is a guide about epiphyllum photos. I am trying to find out what type of plant this is. I started it from a leaf that fell off my sister's plant. Her long stems are about 8' tall that was started 5 years ago. Here is a picture, not sure if I got the full effect of the leaves that are thick and other leaves grow off of them. 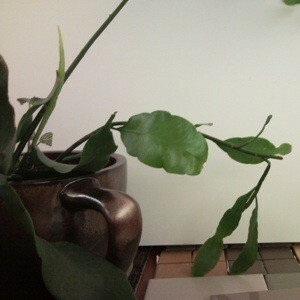 Also the stems get very long then a group of leaves start again. It is not large enough or clear enough to tell what it is,good luck. It might be a night blooming cereus. Looks like a night blooming cerus to me. 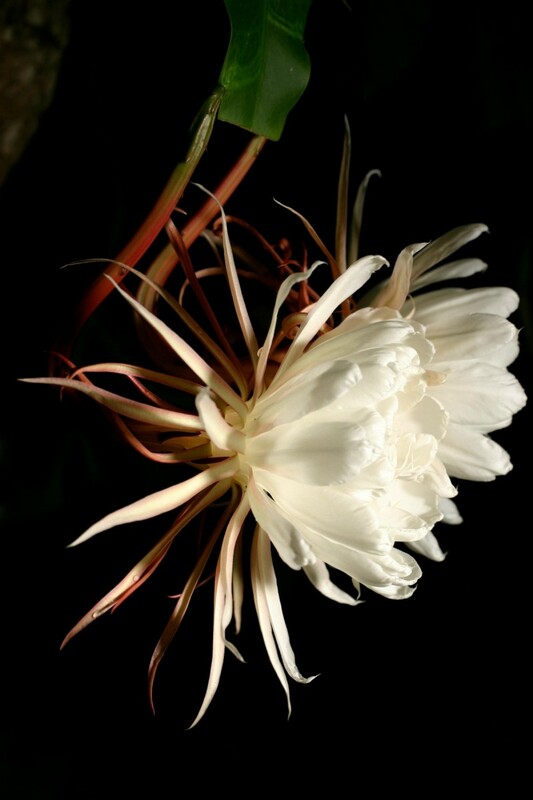 Without any possible mistake this is a Broad-Leafed Epiphyllum popular name is Queen of the Night, because the flowers open at night, the most beautiful flowers for their colour : orange or pink or pure yellow or white and the most incredible fragrance. It is a night blooming cerus plant, it is in the succulent family and only blooms once a year, but it is beautiful. I have one too, had it for more than a decade & it has never bloomed. I knew it was a succulent, but never knew the proper name. How could I get it to bloom? It is potted with my ponytail palm that is over 4' tall. It is a night blooming cereus. Interesting enough, in Puerto Rico it is referred to as lady of the night, because it flowers open at night and by morning it's closed. I have one that blooms in white. They are beautiful. I have a Queen of the Night/Baby in the Manger that just bloomed tonight/morning. I have never seen that before. Awesome! My question is do you think if I cut the bloom before it closes I can keep the smell and if so how? It smells so good. It has been my experience that you cannot keep the scent of the bloom. I have tried several methods, including placing the freshly cut bloom in the cold and dark of the refrigerator. I did this because I wanted to show the bloom to a friend later in the day. In the refrigerator, the bloom still closes within 3-4 hours and loses it's scent. What a shame. Look at this night blooming cactus (cereus). It began with two sprigs from my best friend, Eddie, who propagated it for me. Two years and an abundant amount of leaves/cacti, it bloomed! I photographed the cactus when the bud first appeared and continued taking the photos until the one, the absolute one bloom came. I'd like to see others' pictures. My friend gave me a start of this odd looking plant. I thought I had killed it, but the other day I was surprised when I saw this awesome flower. Does anyone know the name of it? This is a night blooming cactus. The hummingbirds and bees love it and they were on it last night.